For this card, I layered a piece of Nature’s Poem paper, layered it with Mint Macaron Cardstock, and then adhered it to a Crumb Cake card base. Using the Layering Squares Framelits, I die cut a scalloped square (from Crumb Cake Cardstock), and added a square of Nature’s Poem paper on top. The sentiment (from the Detailed With Love stamp set) was heat-embossed on Basic Black Cardstock, using White Stampin’ Emboss Powder and my Versamark Pad. 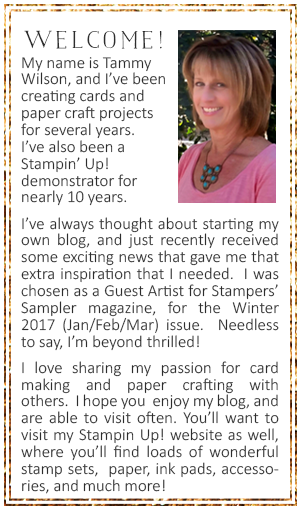 After I cut out the sentiment, I popped it up with a few Stampin’ Dimensionals. I cut a long piece of Mint Macaron Nature’s Twine, untwisted it, and then used a few of the individual fibers to add a bow. For an extra bit of detail, I added a wooden element from the Frames Elements assortment, as well as a few Basic Adhesive-Backed Sequins.